INCH 101: An Introduction To The Basics. 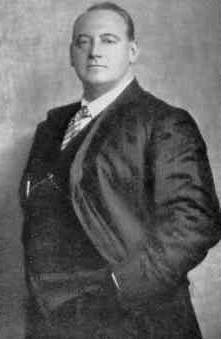 Thomas Inch was born in Scarborough, England, and became Britain&apos;s Strongest Youth, then Britain&apos;s Strongest Man (BSM). He is now known for what is called the Thomas Inch dumbbell. It weighs about 172 pounds and nine ounces, but is usually referred to as the &apos;172&apos;. It&apos;s very thick 2.38" diameter handle is the major preventive factor in thwarting would-be lifters of average length hands. 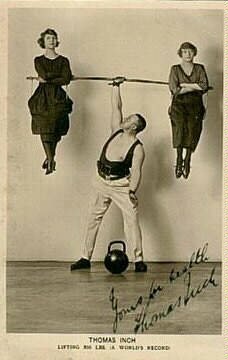 Inch claimed that in his lifetime he never encountered anyone who could lift the 172 from the floor to overhead using only one hand. Even further he claimed that no one could clear it off the floor. He said he had overheaded it literally &apos;hundreds of times&apos; sometimes lifting it twice in the same performance. Inch was well acquainted with virtually all of the strongmen in England, many of whom, he claimed had tried an unsuccessful hand at lifting his bell, and these men included some of the strongest men on the planet. Inch enjoyed explaining that &apos;none of them could stir it&apos;. Is that true? Once, in a very old magazine account he acknowledged that one man had cleared the floor with the 172, but thereafter never acknowledged that man&apos;s success again, and reverted to saying that no man had ever stirred it off the floor. There was another occasion when referring to the attempts of two men Inch said that neither got the bell &apos;very far off the floor&apos; which to me means it did get off the floor, just not very high. And Inch mentioned on other occasions that a prize was given for best effort. What does that mean, if the bell did not leave the floor? Best grimace? Hey, I&apos;m a winner! He offered large sums of money to anyone who could overhead the bell with one hand. At one time the prize money equalled SIX YEARS of Edward Aston&apos;s earnings. Aston had worked for Inch and grew quite accustomed to trying to lift the 172, which he bewilderingly referred to as weighing 180, and he acknowledged that he could not lift it. Tall and broad-shouldered, Prowse played the menacing villain Darth Vader in the 1977 film Star Wars. The film was a hit and Vader became Prowse&apos;s signature role, one he played in two sequels: The Empire Strikes Back (1980) and Return of the Jedi (1983). Even in more recent times no one has taken the bell one handed over the head &apos;clean&apos;- that is, without the bell touching the body on the upward movement. 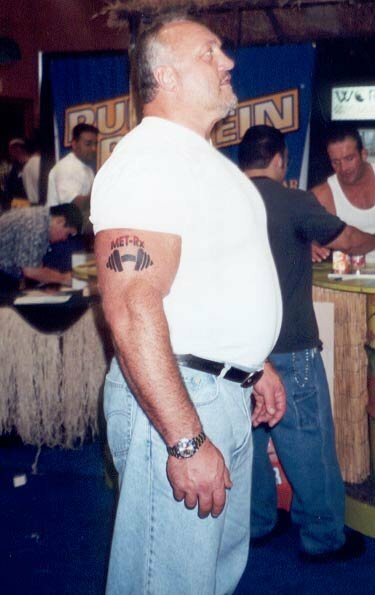 Bill Kazmeier&apos;s lift appears to have been done in the Continental style which allows for body touching on the upward movement to the shoulder. 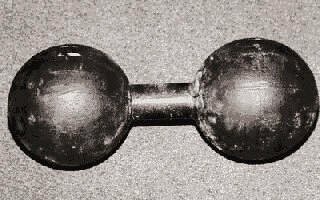 "The thomas inch dumbell weighed 173 lbs. i read. And it also said Bill is the only one to lift it over his head, and only five others have got it up to their knees. Whats so hard about it if its only 173 pounds?" In the next few months, as calendar dates relevant to Inch&apos;s bell roll around, I will examine some of the situations which Inch and others have claimed about the 172- and its triplets. There were four identical bells, which even Inch acknowledged could not be distinguished except by his inner circle of workers- which must NOT have included Aston, who once shouted from the stage when about to make an attempt on the bell &apos;Which bell is it!" To which Inch answered, "It&apos;s the one I&apos;m lifting tonight." The bells weighed 75, 140, 153, and 172 pounds. Other weights have been attributed to them, but after studying the matter for almost a year, and looking through hundreds of old accounts, these are the figures that I believe are accurate. It does not help that all but the 172 have disappeared. The 172 is now in America, having been purchased by a collector. But the 75, the 140 and the 153 have vanished, and one can only hope that they were not among the items carried away from the Inch house after being thrown in the dumpster. David Webster tells the story of how he went by to pay his respects to Mrs. Inch, but she had moved. The neighbor explained to David that old exercise devices and large framed photos and posters of strongmen had been discarded and hauled off. Were the 75 and the 140 bells tossed? The 153 probably was not because we can trace its history away from Inch. Were these other treasures trashed? Was this situation similar to when Vic Boff stopped by to see the widow of an old time strongman hoping to buy some of his weights, only to be told that they had been thrown out? Until someone who may possess these items comes along, we may never know. As the weeks unfold, I will limit treatment to the days relevant to our calendar-line history, so it may be that some parts of the story will be told out of order and that certain answers you would like immediately will be supplied later. In that regard, if something is supplied here that you think is incorrect please let me know. I am NOT interested in opinion, just facts. There would be no need to study history (of any type) if all that mattered was opinion. At the risk of being misunderstood, I fancy that I have looked into the Inch history as much as, and probably more than, anyone else, and have discovered some glaring inconsistencies among the reports and claims. So if you have read something that disagrees with what I present, please anticipate that I may have also read it (900 copies of Health & Strength) and thousands of other magazines, and that I have settled on an answer that was not found in the text you present as rebuttal. On the other hand, perhaps in a magazine or book that I have not seen sleeps the answer. But there are so many discrepancies among the texts that I have read that it would require several very enlightening accounts to filter fiction from fact by opposing accounts. 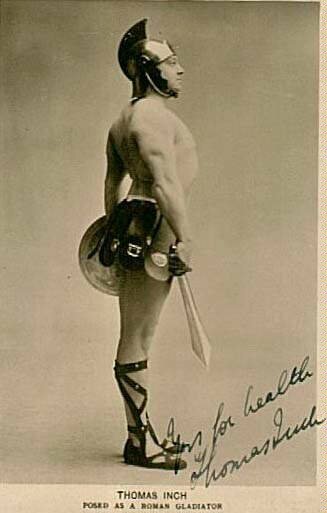 Next week we will examine the occasion on which Inch left the 172 at Hengler&apos;s Circus (where the London Palladium now stands) for the wrestler Ivan Padoubny to try. Apollon was also there. Why did he not attempt the 172, which for him would have quite literally been a plaything? As an example of what the previous paragraph refers to, how long did Inch leave the 172 at Hengler&apos;s? Was it one day, one week, or two weeks? Depends on which account you choose. All those times were claimed, and in case you are thinking there was more than one occasion on which he left the bell at Hengler&apos;s, then stay tuned. The original Inch 172 has a handle width of 4", and it was originally thought that this narrow hand spacing would prevent a wide-handed man from a fair try. This does not seem to have proven true. 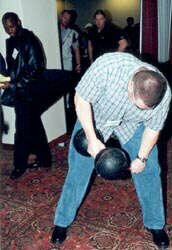 Mark Henry, a giant pro wrestler with the WWF had no problem fitting his hand around the bell and pulling it about chest high. The replica bell also has a handle 4" wide, but whereas the original handle is 7.5" circumference, the replica is 7.75" circumference. The relative diameters would be: original 2.38" and replica 2.47". For comparison, a standard soda can is 8.25" in circumference. Corey St. Clair Lifting Thomas Inch Dumbbell Replica. Inch claimed to have small hands. But David Webster who knew Inch does not remember Tom&apos;s hands as being smallish. There were periods in his life when Inch himself could not lift the 172- his own writing proves this, though that was not his intent of those writings. One of the main problems in tracing the history of Inch and his bells is that because there is so much discrepancy among his various accounts, the student must choose which version to accept based on other sources, and try to blend fact from the whole picture. It is an amazing maze as you will see.